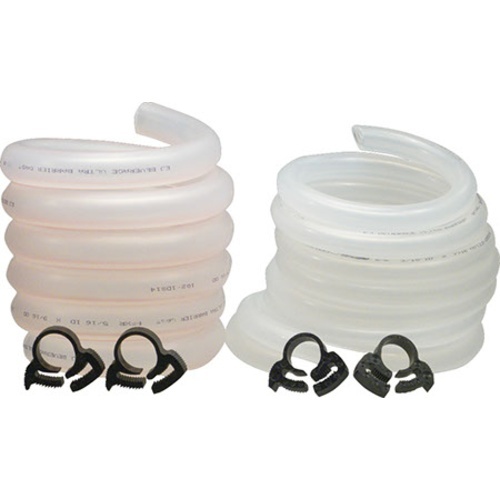 The best tubing kit for setting up or converting an existing draft system. Not only is the tubing made from the EJ Beverage's revolutionary Antimicrobial and PVC Free tubing that is quickly becoming the standard in draft tubing, it is coiled into tight loops that will keep your draft system nice and tidy. The coiling process actually costs more than the production of the tubing - but it's worth it when you're not hunched over the back of your kegs trying to un-tangle some lines that got crossed up. Help your customers treat themselves to a clean, peaceful and easy to maintain environment in their kegerators. 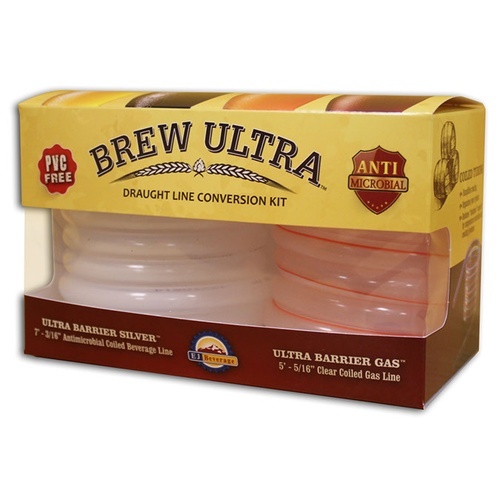 The 3/16" ID beverage tubing has an antimicrobial inner lining that is designed to not allow bacteria to grow in the tubing, reducing the likelihood that the flavor of your beer is ever compromised! It is also PVC free which is now the standard in Europe for draft tubing and soon will be in the USA. The silver based antimicrobial liner will last for 2000 pints before needing to be replaced. The 5/16" ID beverage line has a red stripe to identify it as gas line. In commercial systems red always indicates gas line. Multi-Unit pricing and POS materials are available.